November this year came with a long weekend celebrating Islamic New Year. 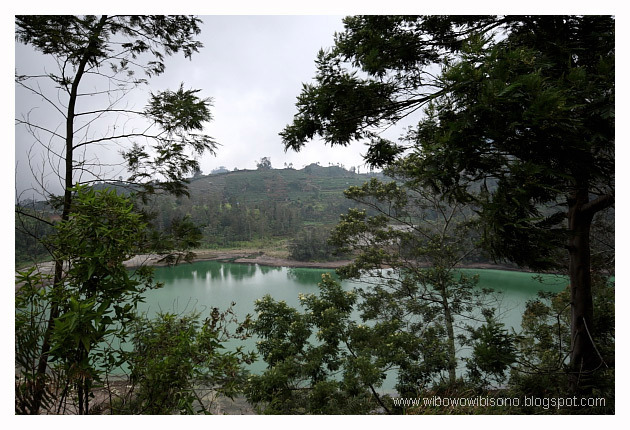 I didn’t plan to travel until my friends from work, Irfan and Endah, came up with an idea of traveling to Dieng, a volcanic plateau in Central Java Province. I wouldn’t want to miss it of course. I had been dreaming of going to that place for like years. 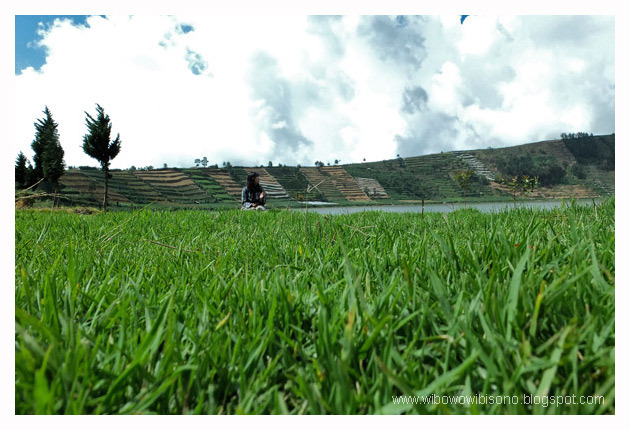 So, Irfan made a small research on what places we should go in Dieng and booked the bus tickets, while Endah made a reservation at the lodging we were going to stay. We decided to spend two days and one night in the plateau, hoping to release all the stresses we got in Jakarta. Coming to this place for the very first time, I got an impression that it was the land where people lived on a volcanic ground and where potatoes had nearly become the stapple food. Many thanks for coming. We left the office earlier on that Wednesday afternoon, 14 November. 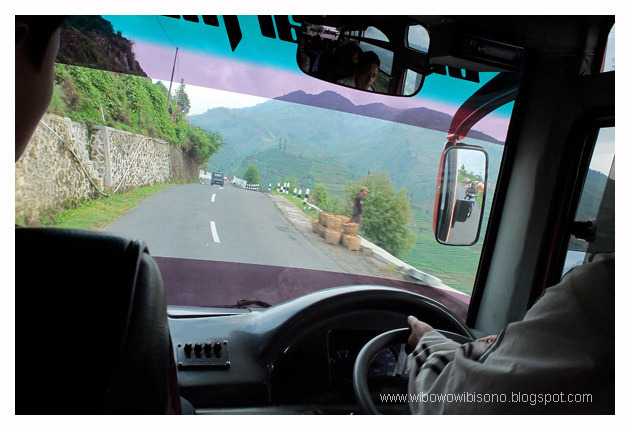 Taking a cab, we headed to bus station at Lebak Bulus where we were going to depart to Wonosobo – a nearby town from Dieng – with “Sinar Jaya” bus at 5.00 PM. I spent most the time at the bus sleeping and was wakened up by Irfan at five in the morning. 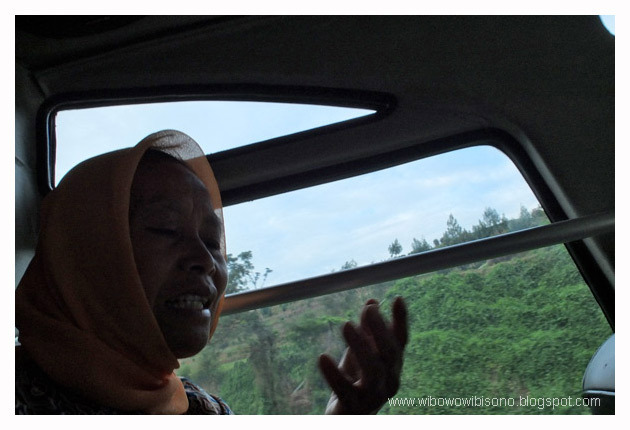 We were passing through the town of Wonosobo then. We thought we had to get off from the bus at the bus station, but we were wrong. By using GPS feature from his smartphone, Irfan learned that we had gone a little bit too far from the place we were supposed to get off from the bus. Despite the panic, he approached the driver to confirm the problem we had. And yes, we had missed that place. We were supposed to get off at a place called Plasa (local term for plaza), an open space where there were some mini buses waiting for passengers to Dieng. The bus finally stopped at Wonosobo's bus station. 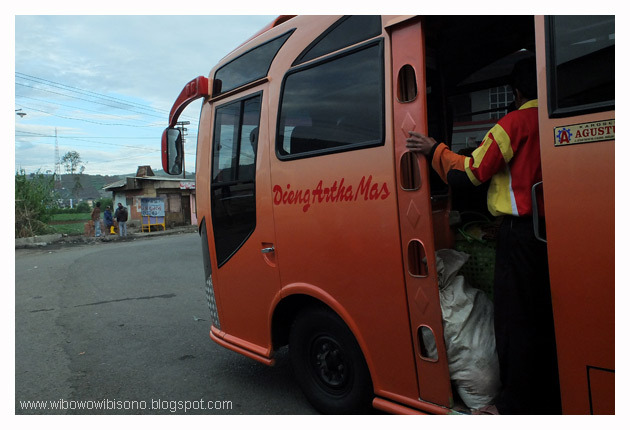 There was no bus to Dieng departing from that station. As we got off, we were welcomed by Ojek (motor taxi) riders. They offered to take us to aloon-aloon (town square) which they said to be the last stop of the bus to Dieng before leaving the town and it was a bit farther than the Plasa. We took that offer and agreed with the fare they requested. Along the way to aloon aloon, I could see that Wonosobo was a quiet small and peaceful town. It was more like a mountanious town and it was cold. We were almost frozen in that morning. 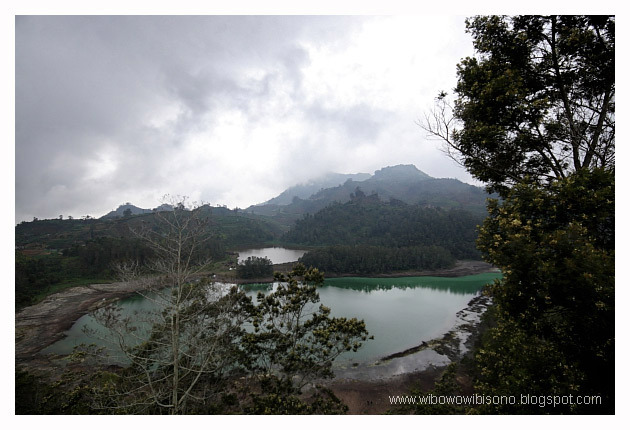 Within less than ten minutes, we arrived at aloon aloon and jumped to a mini bus that would take us to Dieng. The mini bus was loaded mostly with the locals. I could smell the scent of "kemenyan" (Javanese incense), coming from their cigarettes. 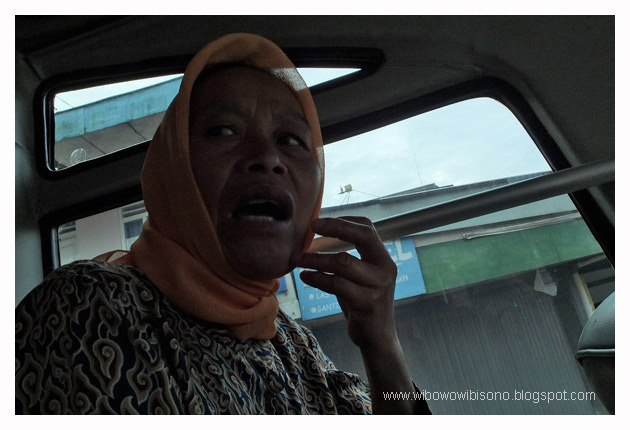 From the conversation I had with Ibu Rumiatun, a woman sitting next to me, I found that most of the passengers were traditional traders. They were heading to Batur (the last stop of the mini bus) to pick up crops from local farmers and sell them at the traditional market in the town of Wonosobo. And that was also what Ibu Rumiatun did to earn a living. 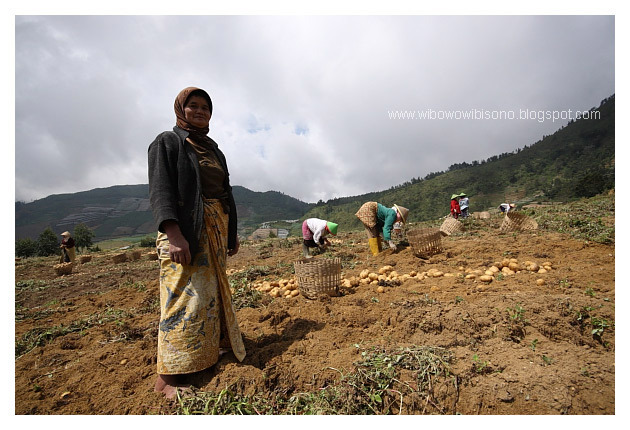 “I have been doing this job since I was fourteen,” said Ibu Rumiatun about her daily activity. Further, she told me about her personal life. Getting married at the age of fourteen, she had given birth to seven children. When there was a construction project going on, she took a break from selling crops and opened a food stall serving the construction workers. 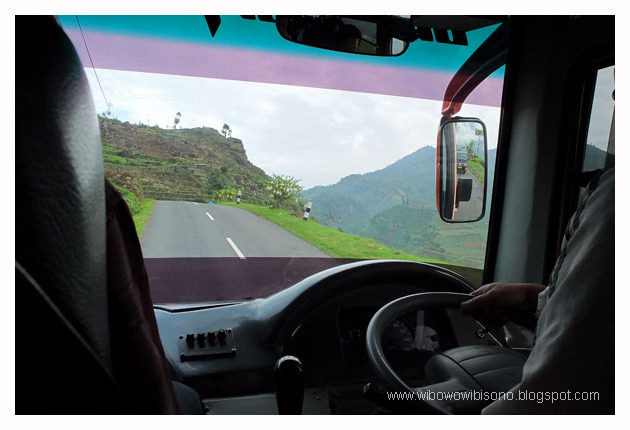 Closer to Dieng, we passed through a winding mountainous road with a cliff on one side. This reminded me so much of the road in Pangalengan, West Java. 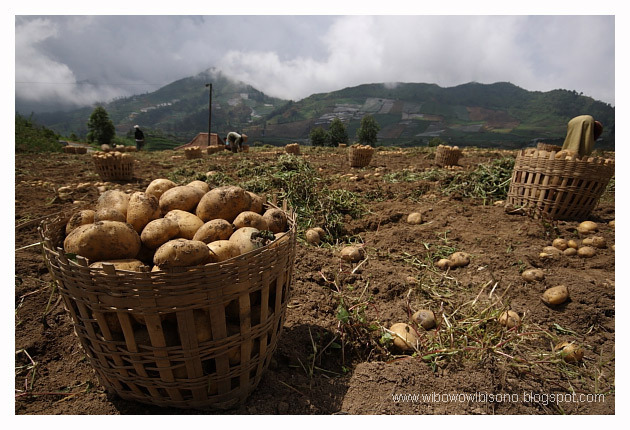 I noticed that nearly all the surrounding hills had been deforested for farming, mostly potatoes. 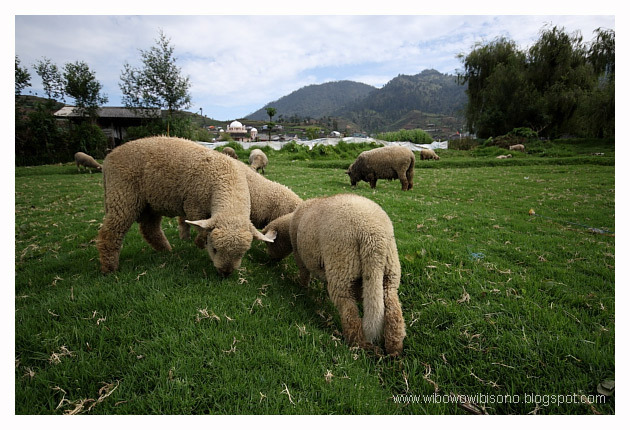 It was something beyond our expectation that we arrived at Dieng within an hour. Most journals in some blogs said two hours. We got off right in front of “Hotel and Resto Bu Djono.” In my opinion, the word “hotel” was really exaggerating. It was just a two-story-house that had been set as lodging. With a small restaurant on the ground floor, the place had less than ten rooms. The hotel was quite famous and could be easily found on every journal people wrote on Dieng plateau. Endah had made a reservation two weeks earlier and had been told that we would be placed at Hotel Asri, a hotel that was in the same management with Hotel Bu Djono. We entered Hotel Bu Djono and found nobody in the lobby. An old man came out and greeted us warmly. We told him who we were and asked for his permission to use the toilet. Then I talked with the old man. From the small talk we had, I found that his name was Ahmad Luki Surianata. 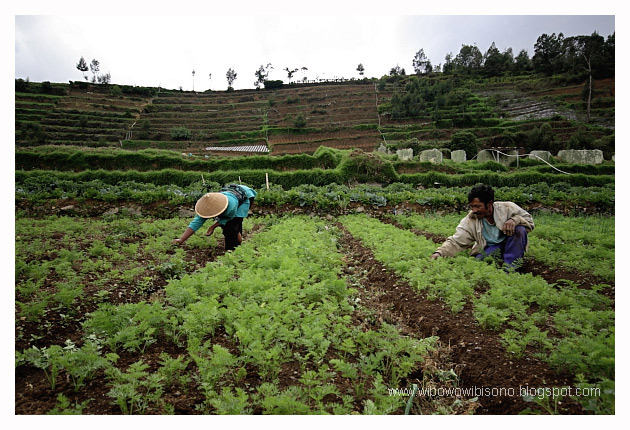 He was a retired geologist who had been stationed in Dieng for 35 years. Born in 1938, Pak Luki was raised in Jakarta until graduated from the junior high school. 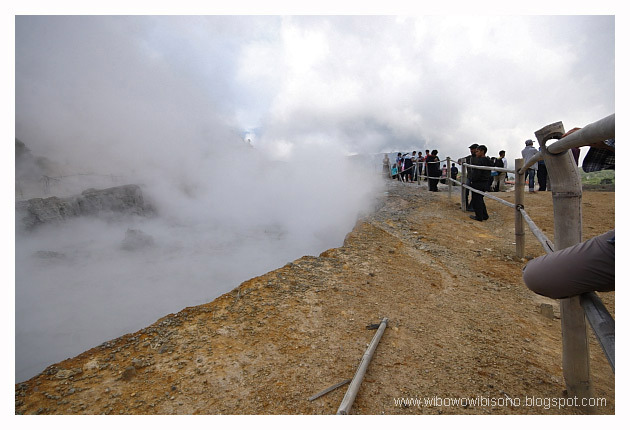 Then he went to Bandung to continue his study until finally earned a diploma degree in geology. While he was being stationed in Dieng, he met a woman who captivated him and later became his wife. Few months earlier, his wife passed away, leaving him with two children. 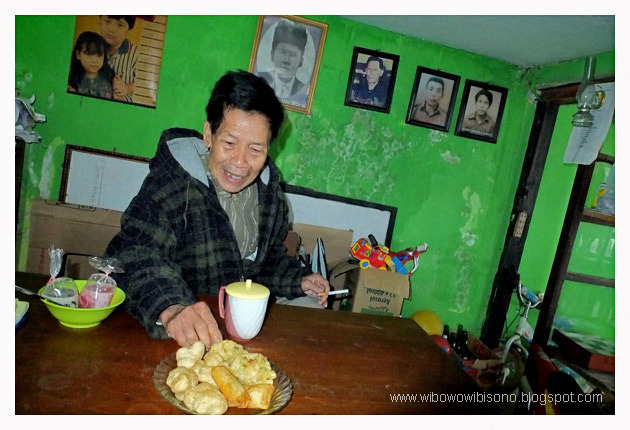 That morning, with fried tofu and hot tea for breakfast, he was sitting in front of the portraits of the former geologists hanged on the green painted wall. Shortly after that, we walked to Hotel Asri, about few meters away from Hotel Bu Djono, where we were going to check in. The check in was not until 12.00 PM. The room we’d booked was still occupied by other guest. Fortunately, we were allowed to store our baggage and take a shower. 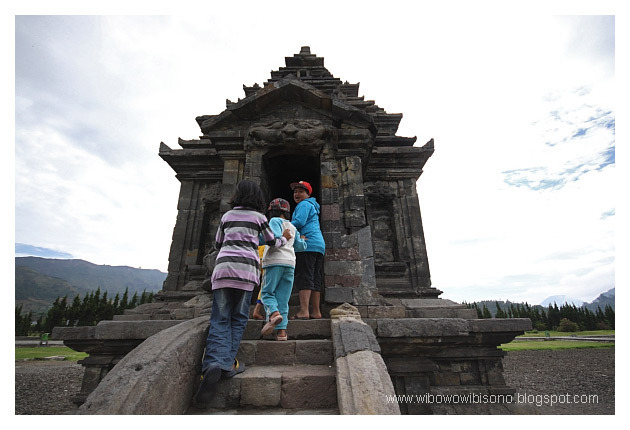 Our first destination was the ancient temple of Arjuna which was located not so far from the hotel. To reach it, we had to walk across a farm. Irfan and Endah stopped for a pose. Few meters before the temple, we realized that we had taken the illegal way to enter the temple. This was not the right entrance. And yet, we proceeded the trip. We were being outlaw. There was not much I could tell about the ancient temple. 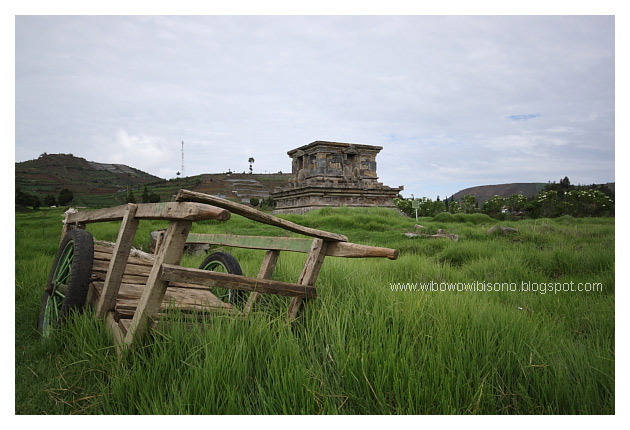 All I knew was that it was used as some sort of meditation place for Hindu people in the past. 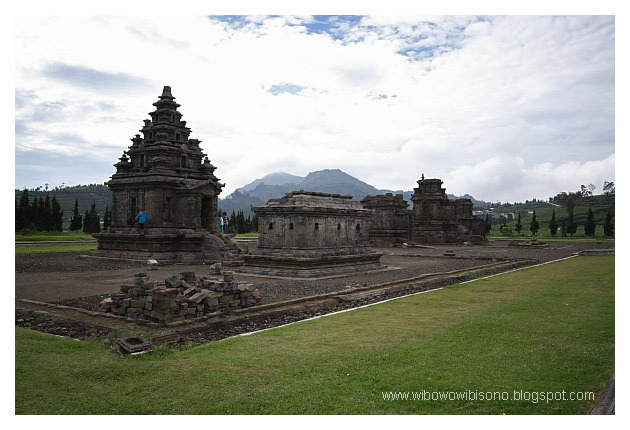 Arjuna was actually the name of the biggest temple. It’s one of the five temples built there. 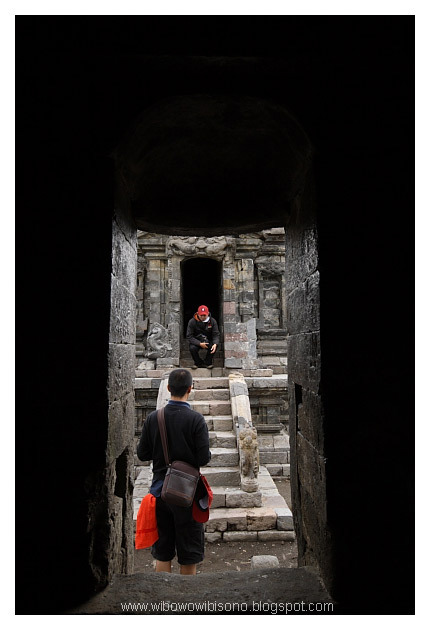 One thing I always did in ancient temple was get inside it and tried to find out what the people in the past saw while they were meditating in it. 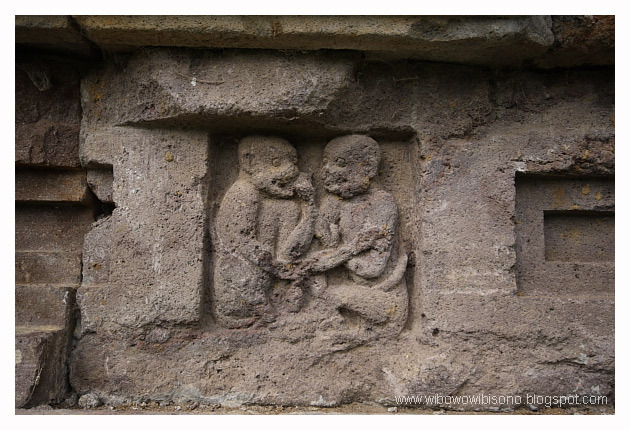 Like in any other ancient temples in Java, people burnt incents as some kind of offering to the mythical figures. There, in Dieng, they had uniquely shaped incents that I had never seen before. Not far from the temples, we found another temple that stood alone. It was named “Candi Setyaki.” I was lucky to find this abandoned wooden cart so as to emphasize the sense of abandonment of the ancient temple. The only things that caught my eyes were the ornaments’ details on its wall. Those engravings pictured twin figures. 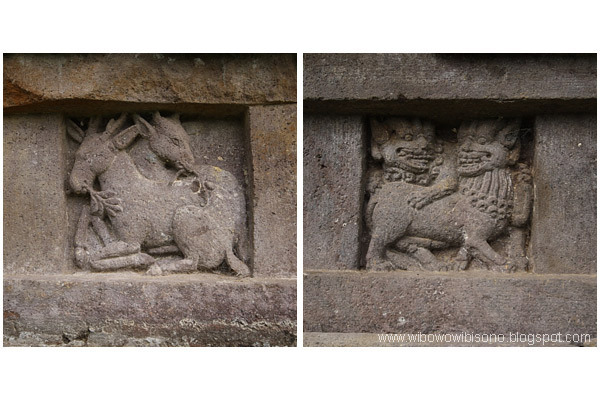 I wasn’t sure what those were, but they looked like monkeys, deer, lions, and a deity figure. 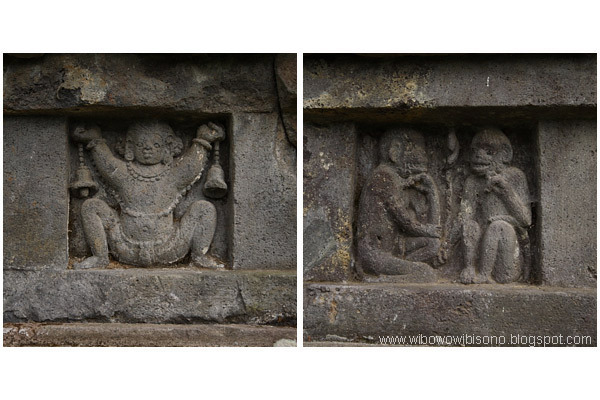 It took us less than an hour to walk around the temples and capture them with cameras. As we headed back to the hotel, we found a group of lambs grazing on a small pasture. We couldn’t resist taking pictures of those lambs. 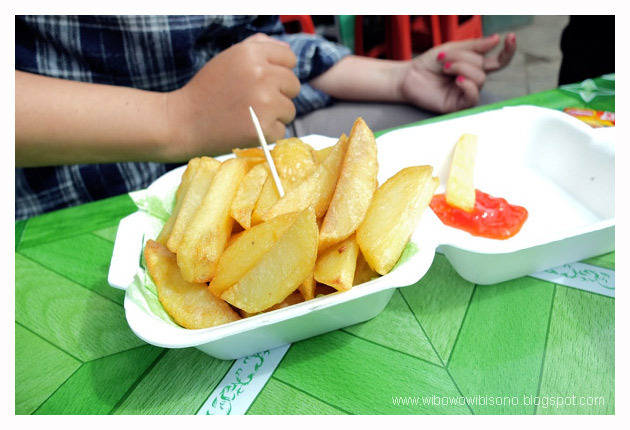 As we reached the parking area outside, we passed by a row of food stalls, selling primarily big chunked fried potatoes. Apparently, potatoes could be very easily found there. 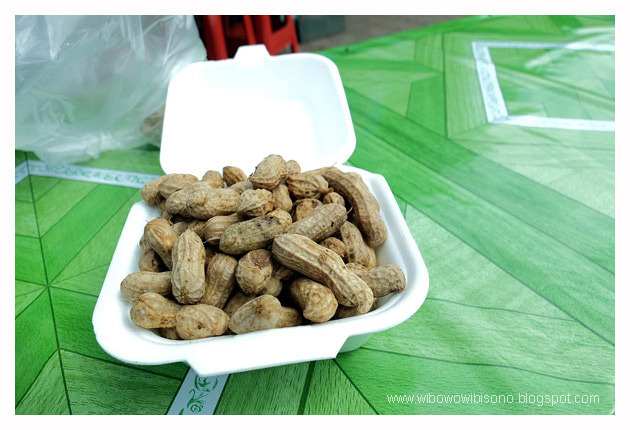 We ordered three plates of potatoes, and one plate of steamed peanuts. And those were our first breakfast in the highland. 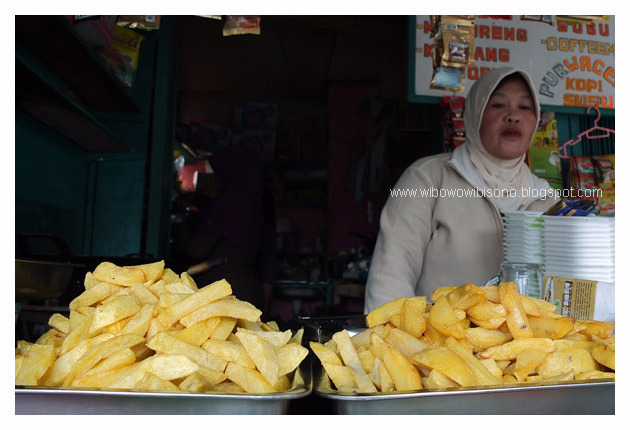 People of Dieng were kind of proud of their traditional beverage which they claimed as the ginseng of Dieng. Sadly, the name was really not popular, especially to the ears of people coming from Jakarta like us. It was “Purwaceng,” a drink made of spices. It came in three flavors; coffee, milk, and original. I ordered the original one. This is what the food stall looked like. Don’t worry about the potatoes which were exposed in an open air. I knew they got cold quickly in such place, but the woman who sold them would kindly refry them for us. We walked back to the hotel and planned to rent motorbikes to visit some places we had seen on the internet. When we asked Pak Didik of the Hotel Asri about the price, he kindly advised that we took a car with a driver. He said it would be much more practical and convenient for us. We took his advice considering the friendly price he offered. The car was not available until 11.00AM, and it was not even 10 o’clock yet. We didn’t want to waste the time waiting for the car. So, we decided to go to the nearest object for tourist, and that was the color lake. It can be reached by foot. Thanks to the local government, the sidewalk there was quite comfortable. On the way to lake, I found a couple working on a farm, planting carrots. They were nice to let me take their picture. Look at the hill at their backs. 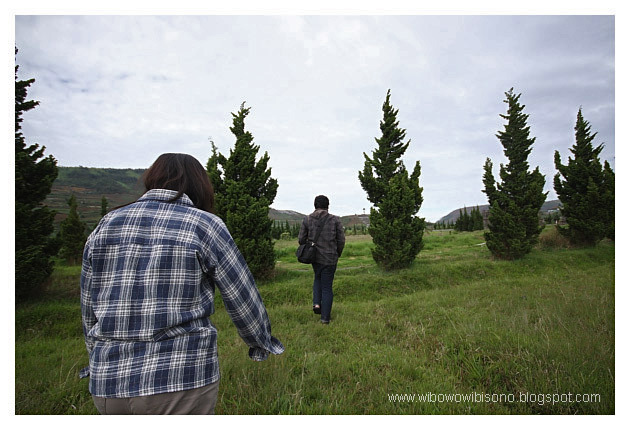 It was a typical condition of a hill in Dieng: deforested. When we reached the lake, we were told to hike a hill first so we could see the lake from above. It was a steep hill, and literally took our breath away to reach its top. We took a break twice just to take a picture or two from above. It took us about ten minutes to get to the top of the hill. And yes, the lake looked beautiful from above. We sat on the cliff edge to enjoy the surrounding nature. It was tranquil. We walked down the hill and went straight to the lake. It was a volcanic lake. While we were sitting on the lake side, under a huge tree that appeared to be like a canopy, Pak Didik called to inform us that the car and the driver were ready and waiting in the parking area. Then, we met Pak Septanto, the driver who would take us around. 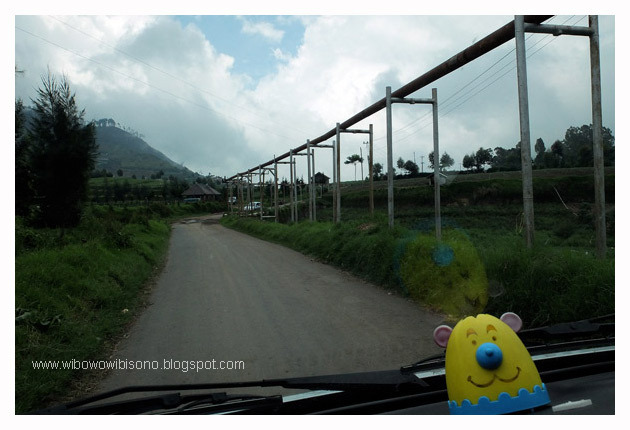 In the next few minutes, we went down the narrow road connecting all tourism spots in Dieng. 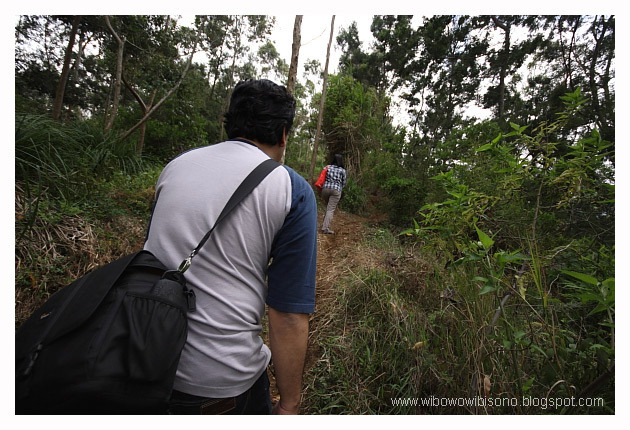 With a map in our hand, we headed first to a natural wheel called Sumur Jalatunda. I personally don't recommend this place as there was nothing interesting to see. The only thing visitors could do was throwing a stone to the wheel and then making a wish. 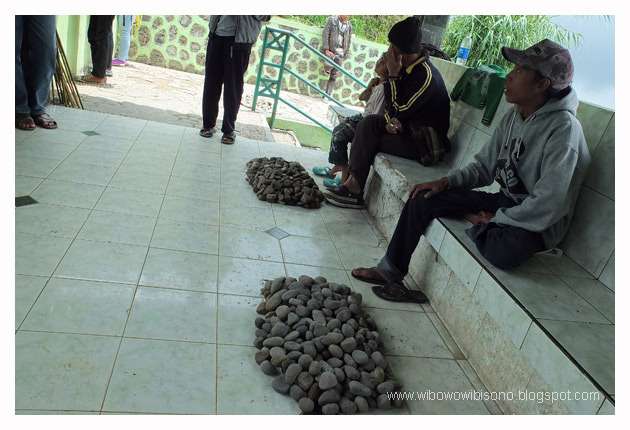 Surprisingly, we couldn't find any stone on the ground, so those who wanted to do that stupid thing had to buy it from the locals who tagged the stone with the price of five hundred rupiah per each. 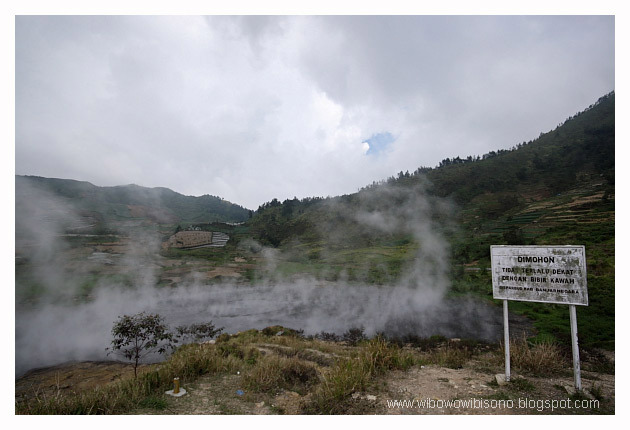 Dieng is a village where the people live on a huge stove. It's a volcanic highland where we can easily find active craters lay everywhere. The first crater we went to was Kawah Sileri. I was amazed by how the local people farm side by side with the crater. I wasn't sure if it was legal. The local authority had put a warning sign to keep people standing in the save distance from the crater. 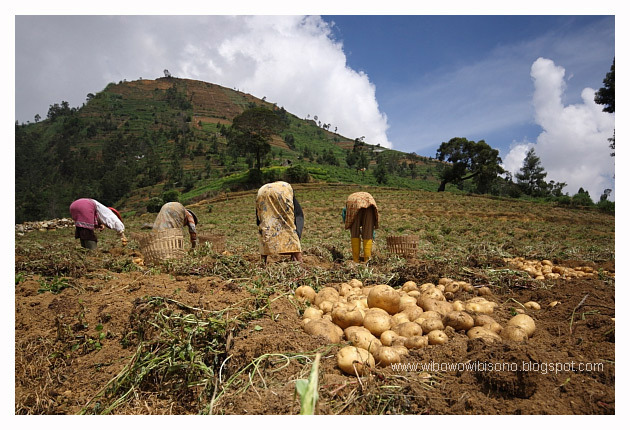 As we returned to the car and were about to leave for the next spot, I saw a group of farmers, picking up potatoes on a farm. I couldn't help but getting out of the car with my camera. I was glad that they allowed me to take their pictures. 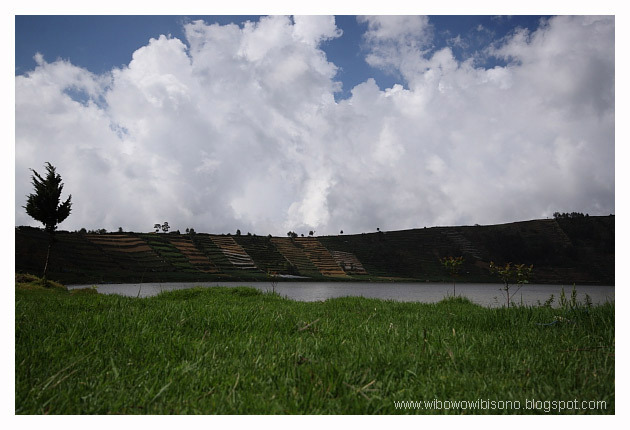 This farm was located a few meters above the crater. 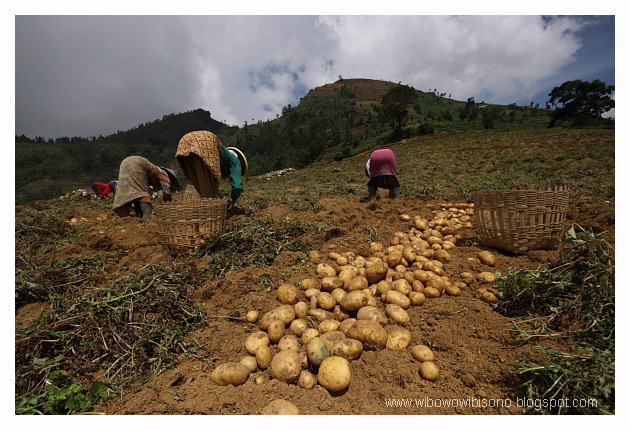 The fact that many lands were cultivated with potatoes had constantly indicated that Dieng's potatoes were in high demand in the market. 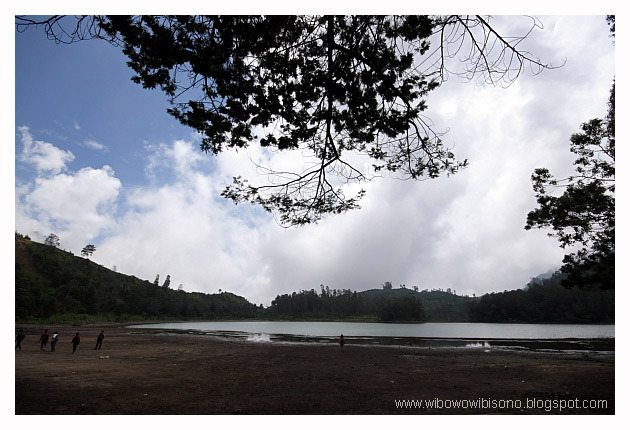 Another lake we came to was Telaga Merdada. Nothing's special there. 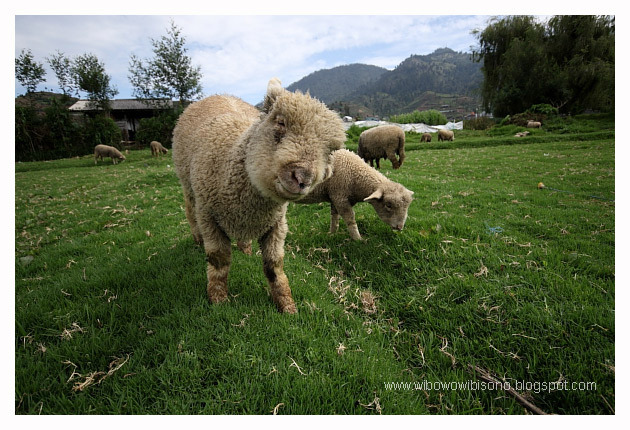 The only good thing we found was the green grass which appeared to be like a carpet. 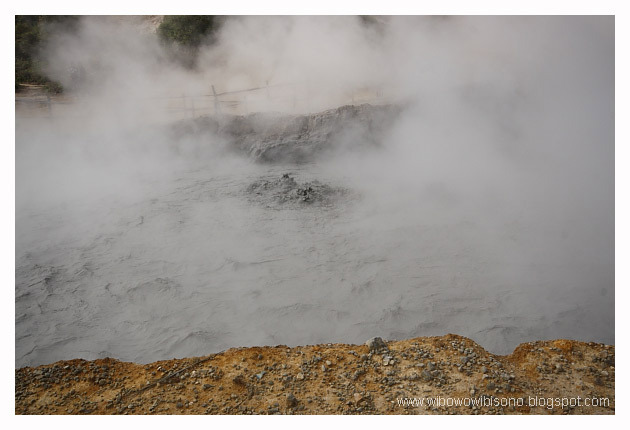 A moving crater was how I described Kawah Sikidang. 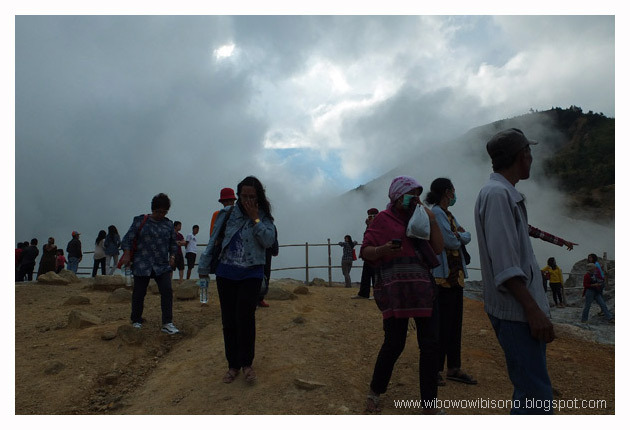 When we got there, Pak Septanto told us that when he was young, the area where the visitors parked the car today, used to be a crater. Today, the crater had moved hundred meters away. Amazing, wasn't it? On the way to the crater, we found many newly born craters. They were in the form of holes, and they constantly smoked. 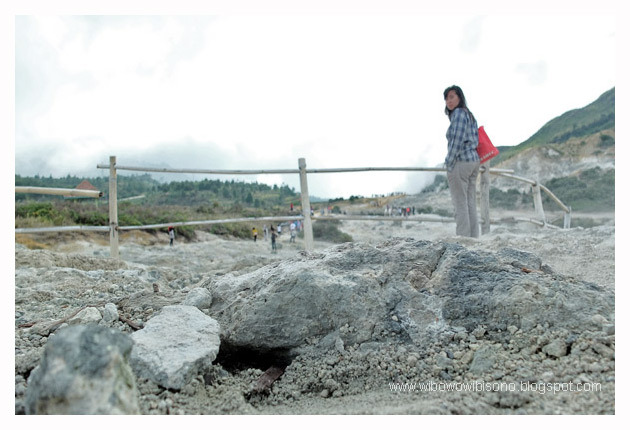 Some people couldn't bear the gas of sulfur coming out from the crater. Wearing a mask seemed to be the most practical solution. 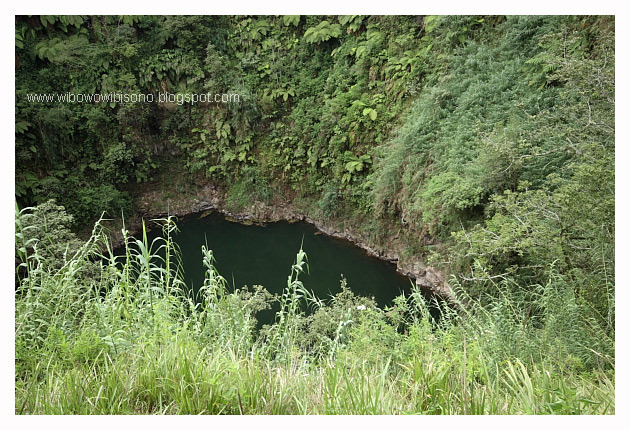 The barrier installed to keep people away from the crater was a circular bamboo fence. I found this a little bit unsafe, especially for children. Standing on the fence, I could see clearly what a crater looked like. It was like a big bowl of boiled mud. On the way back to the hotel, we dropped by at the Museum of Dieng which, to me, looked like a warehouse that stored ancient artifacts. 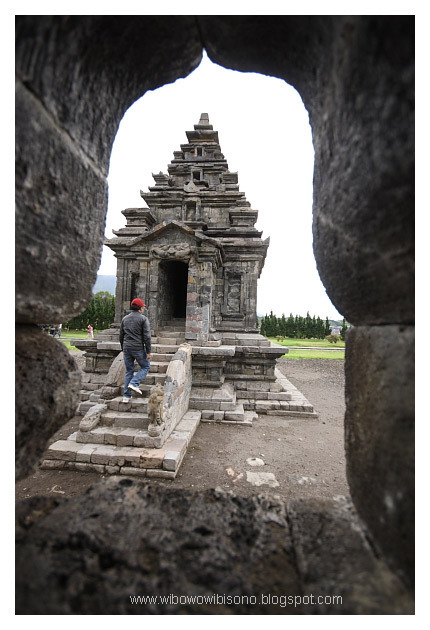 We were more interested in a temple stood alone in front of the museum which was named after Gatot Kaca, a figure from the epic of Mahabaratha. Stepping inside the temple, I found a typical stone table that commonly used to place offerings like flowers or incense. It was nearly dark when we returned to the hotel. The temperature started to get lower and lower, and that led to us to being starving. That night we walked down to Hotel Bu Djono for dinner. Unfortunately, the restaurant was closed due to a memorial service for the late wife of Pak Ahmad Luki, the old guy I had met earlier in the morning. Right behind the hotel, we found a food stall selling foods made of mushrooms. I had mushroom soup which tasted terrible, while Irfan and Endah had fried rice with mushrooms and eggs. I was kind of so hungry I forgot to take the picture of the soup. Back to the hotel, we decided to sleep early as we would be pickep up by Pak Septanto at four in the morning. We were going to Bukit Sikunir to watch the sunrise. It was said that the sunrise would be dramatic as the sun arose from the back of three great mountains. That night, I laid down on the couch, next to a fireplace, and slept like a baby. 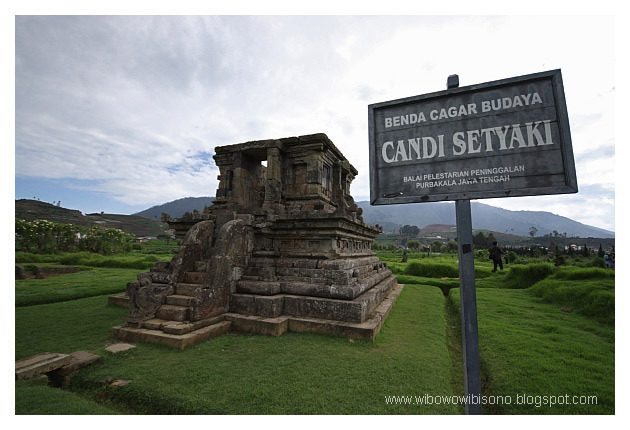 your writing reminds me of the several times i visited dieng. 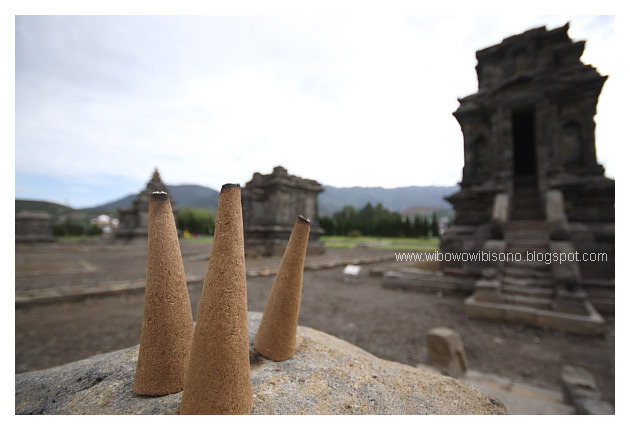 my image of dieng is potato, temple, craters, and mushroom. i think i ate in the mushroom restaurant before and also ordered the soup. it's like those classic sup desa, iinm. 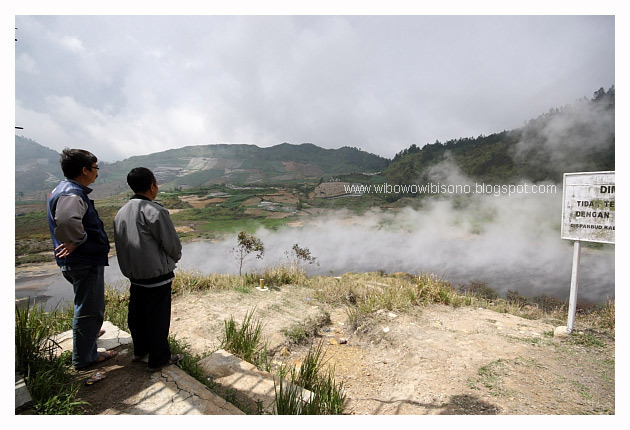 wanna go to dieng again one day. I didn't know if you'd been there several times... 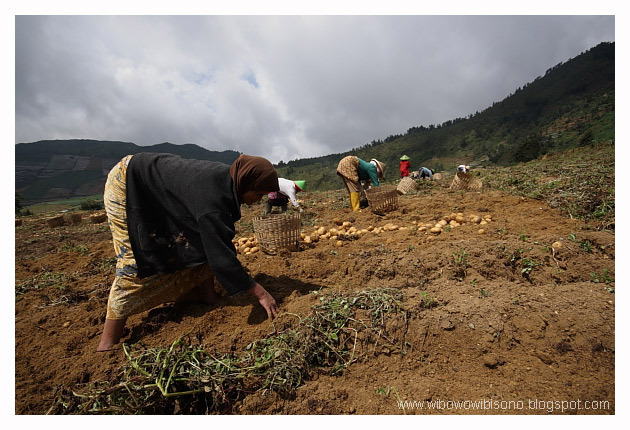 Yes, I was told that there was some kind of mushroom food industry in Dieng which no longer exist today due to the low demand. 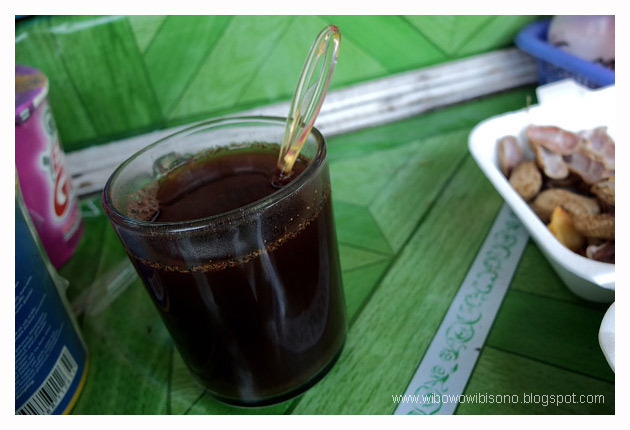 Yet, the "warung" with its traditional taste soup remained. Thanks for coming to this blog. 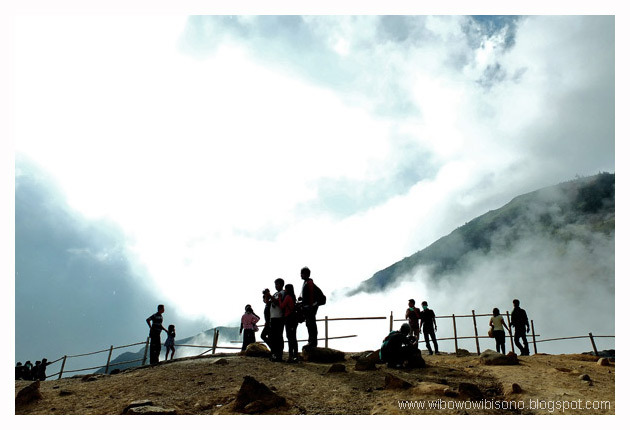 Hope you can make it to Dieng again. I really like your photos & writing! two thumbs up! Couldn't agree more with you about the lambs. Oh ya? I guess for both of us, colleague means architects. Don't you thing so? Anyway, Endah and Irfan are not architects. That's why I didn't use that word. Well, I'm not really sure actually. Let me check it in the dictionary. You're right! I couldn't believe they picked all the stones and didn't leave a single one for us.